This precious 19th century Japanese sword was made in the Kesho style by the school of Yasutsugu. There are various styles of the Japanese katana, but the Kesho is the most important one. 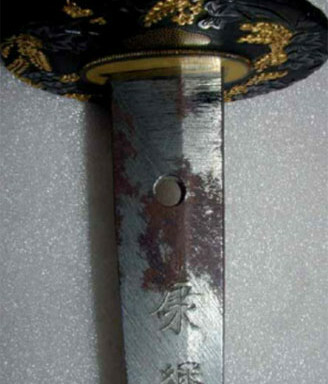 The blade has been made by Yasutsugu himself – IX or X dynasty – who also gave his name to his famous school active between XVI and XIX century. The Yasutsugu School was one of the official schools of the Shogun Tokugawa (this family ruled in Japan from 1603 to 1868). The blade is in surprisingly good condition but suffers oxidation and erosions of the steel. There are also dents and scratches of the surface. This piece was pledged in 2009 is completed.